The establishment of the strategic partnership between Vietnam and Indonesia in 2013 is an important milestone in bilateral relations, creating an opportunity for the two countries to develop their traditional friendship to a new height. 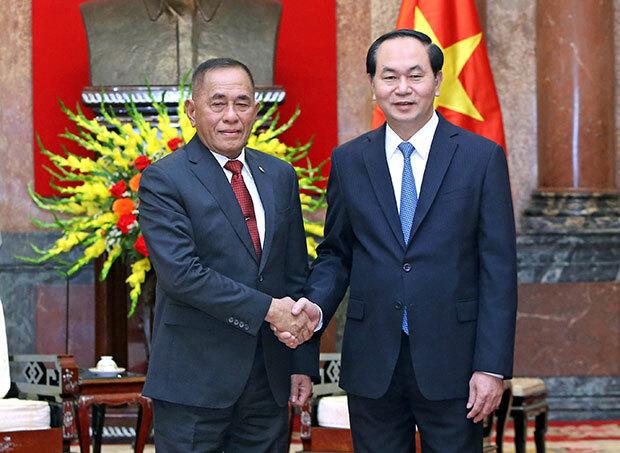 During a meeting with Indonesian Minister of Defence Ryamizard Ryacudu in Hanoi on August 8, President Tran Dai Quang expressed his pleasure at the fruitful cooperation between the two nations, especially in politics, economy, culture, education-training, and defence. The President said Vietnam highly valued Indonesia’s significant role and position in as well as its active contributions to promoting multilateral collaboration, especially within the framework of the Association of Southeast Asian Nations (ASEAN). Vietnam always attaches much importance to developing ties with Indonesia, regarding the country as a top priority in its diplomatic policy, he said, adding that the reinforcement of bilateral relations is for both their benefits and for peace, stability, cooperation and joint development in the region and beyond. He praised Indonesia for its clear and consistent standpoints over the East Sea issue, saying he hopes Indonesia will promote its role and together with Vietnam and other ASEAN member states enhance the implementation of the ASEAN Community’s targets. He also welcomed the outcomes of the talks between the two countries’ defence ministers and proposed the two sides actively realise the bilateral affiliation agreements. Regarding the settlement of emerging issues at sea, the President suggested the two sides’ maritime forces take measures to raise awareness among fishermen and prevent them from violating the waters of their respective countries. He called for humanitarian treatment towards fishermen as the two sides have yet to conclude negotiations on the delimitation of exclusive economic zones. The Indonesian defence minister informed the host about the outcomes of the talks with his Vietnamese counterpart Ngo Xuan Lich, during which the two sides agreed to fully and effectively implement the Memorandum of Understanding on enhancing cooperation among defence officials signed in October 2010. Special attention will be paid to all-level delegation exchanges while setting up a defence policy dialogue mechanism, sharing experience in humanitarian assistance, joining the UN peace keeping forces, and increasing cooperation in navy and defence industry, he said. He added that he hopes Vietnam will play a more crucial role in ASEAN. He also shared Indonesia’s viewpoints on East Sea security and anti-terrorism, stressing the need to strengthen multinational coordination to maintain maritime security. He agreed on the President’s proposal in the matter concerning fishermen and promised to inform the Indonesian Ministry of Foreign Affairs and Ministry of Maritime Affairs and Fisheries. The Indonesian official is making his first visit to Vietnam as Defence Minister from August 7 – 9.